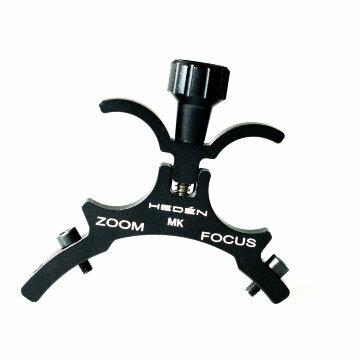 Hedén VLC Zoom and Focus Control. Sorry for the lack of post recently, but I’ve been busy on various overseas shoots using the Sony Venice camera. I’ll be writing these up in due course. My 2 favourite and most used lenses are my Fujinon MK zooms . I use the MK18-55 and MK50-135 on both my PMW-F5 and on my FS5. I’ve also used them on a Sony Venice. They are really great lenses. But one thing that I’ve always felt would make them a bit better is a power zoom. Enter the Hedén VLC system. Heden servo motor to turn a non servo zoom into a power zoom. In this case on a Fujinon MK18-55 lens. 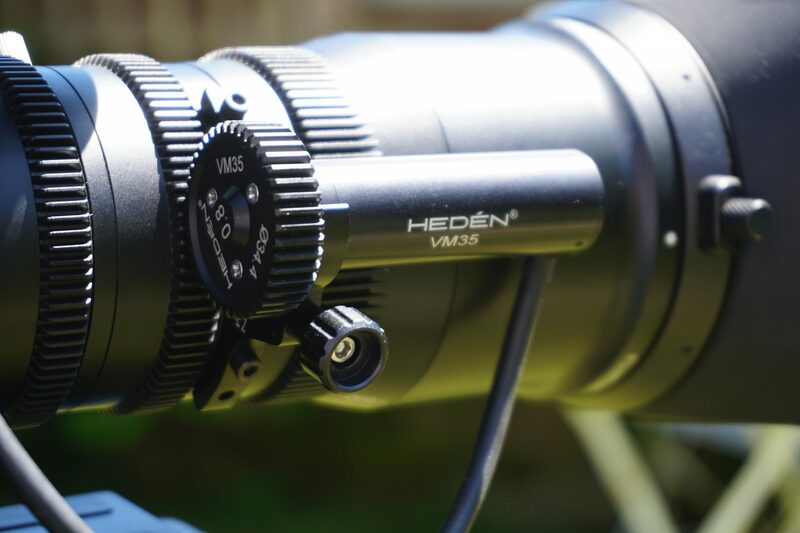 For starters the Hedén VLC system allows you to turn a non motorised zoom lens into a power zoom lens, but the Heden VLC system is more than just a zoom motor and control box. It can be expanded with a second motor to not only motorize the zoom but also provide an electronic focus control (although as yet I have not tried this). Never heard of Hedén before? 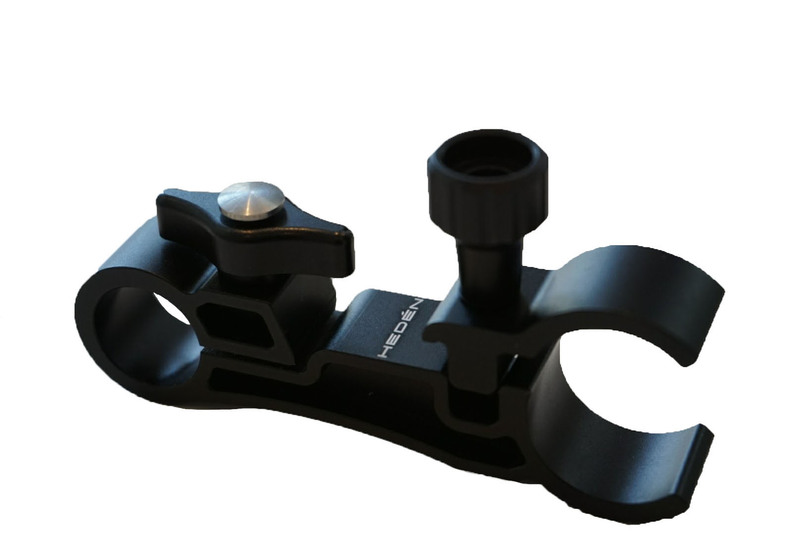 Well if you work in higher end features and productions you will probably have come across them before as they are a highly regarded Swedish manufacturer of electronic follow focus and zoom systems used in high end Cinematography. For me though, until now their products have been beyond my reach. One of their standard follow focus motors costs around £1.6K/$2K. However the motors and components used in the VLC systems are much cheaper, yet still meet Hedén’s exacting standards. A complete VLC zoom system, including motor, costs around $2,100 USD. It’s still not a “cheap” item, but the system is of very high quality and surprisingly flexible, so it is something that should last many years and work with not just todays cameras and lenses but also whatever comes next. The VLC system comprises several components. A control box, a motor or motors along with various attachment brackets for the motors depending on your application and a set of cables. The first time I played with the system it was an early development unit on my FS5. 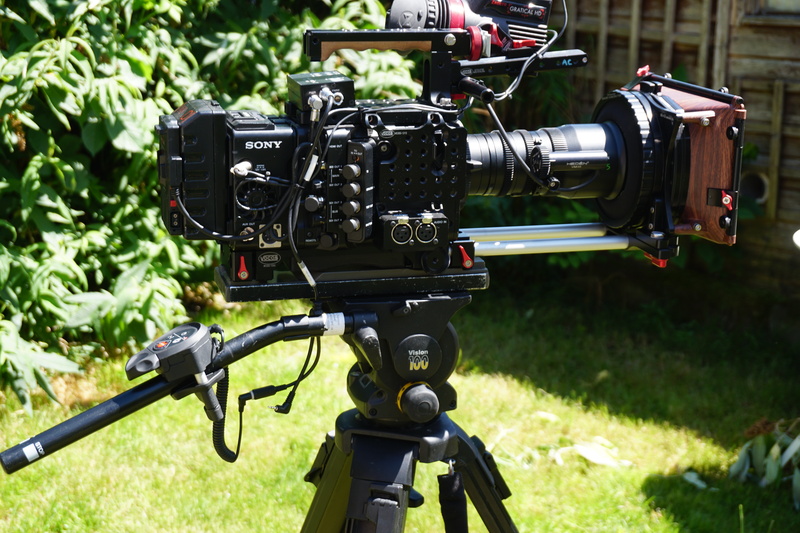 On the FS5 the system is controlled using the Lanc control functions built into the cameras existing handgrip. The cable from the hand grip that normally plugs directly into the camera body is plugged into a breakout cable from the VLC control box and then another connection from the control box plugs into the FS5. This way the handgrip controls the FS5 as normal, but now the zoom rocker on the handgrip also smoothly and accurately controls the Hedén zoom motor. All the hand grips other functions continue to operate as usual. 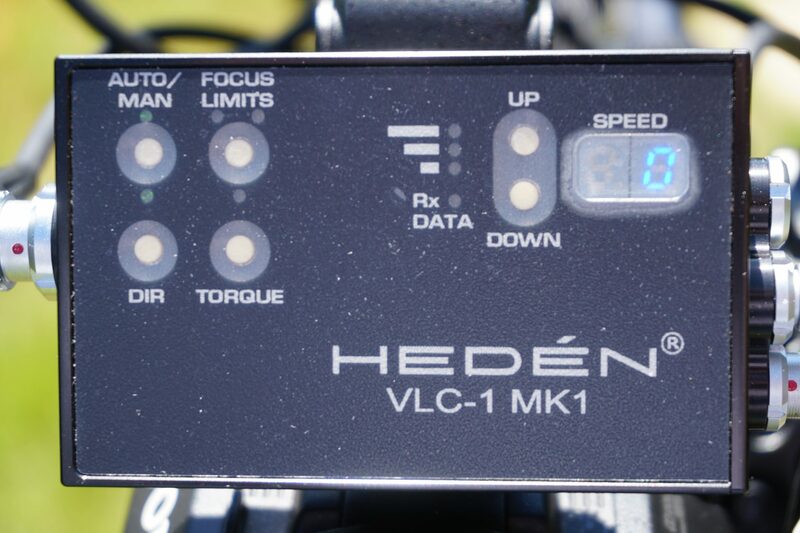 The Hedén VM35 servo motor for the VLC zoom and focus system. The motor used by the VLC system is a very high quality compact servo motor and gearbox with digital position and speed feedback. So the controller knows exactly how fast the motor is turning and where it is in it’s operating cycle. The first time you use the system it needs to be calibrated for the lens you are using. This is done quickly and simply, just by pressing the small CAL button on the controller. Once pressed the motor quickly runs back and forwards to find the lenses end stops. The CAL button used to calibrate the Hedén VLC zoom system. A very nice feature is that when the motor isn’t being driven it can be turned quite easily. This means that unlike some other similar systems you don’t have to mechanically or physically disengage the motor from the lenses pitch gears to perform a manual zoom. In fact, the motor acts as a soft damping system and helps make manual zooms smoother. My only gripe about the VLC system is the size of the control box. On a camera as small as the FS5 the control box is quite a big lump to add. 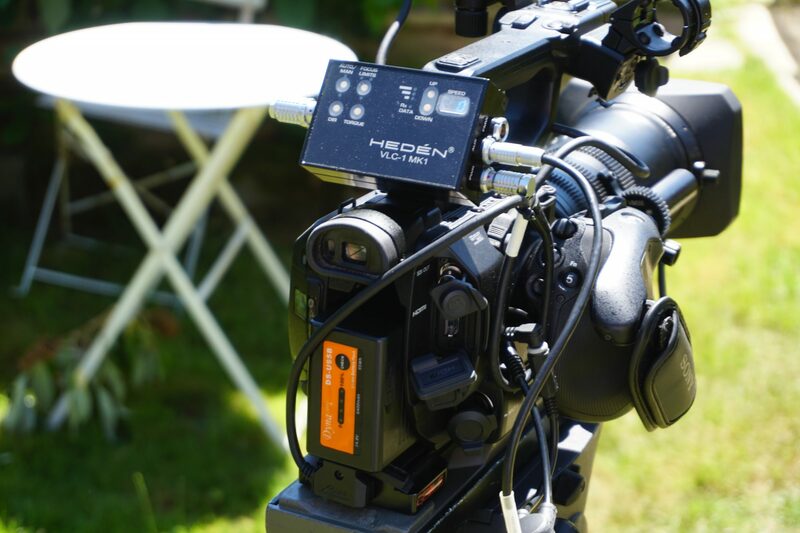 The Hedén VLC system mounted on an FS5 and Fujinon MK lens. 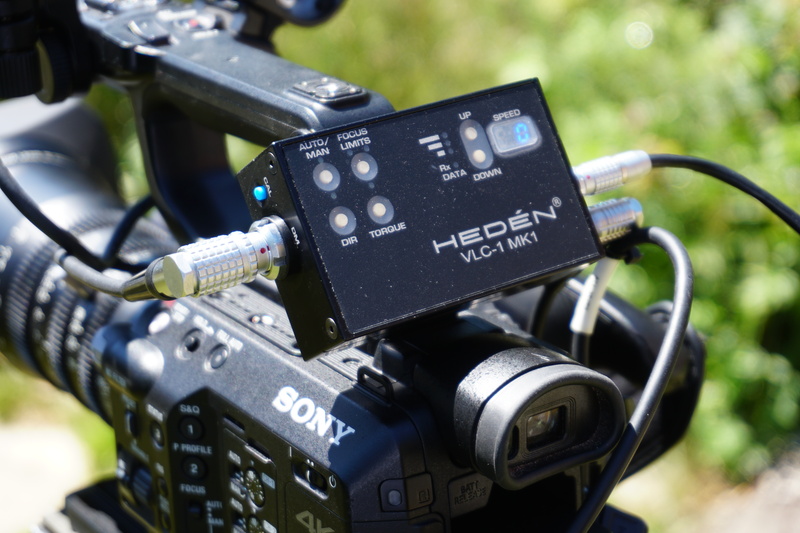 I have the Hedén VLC control box mounted on the rear of the FS5’s handle using the 3M Dual Lock provided with the kit. For power I run it from a Dynacore BP-U type battery that has a D-Tap output. There is no on/off switch, so you turn it off by unplugging it, but the system doesn’t use much power and I barely noticed any difference in the life of the camera battery when using it this way. The control box has controls for the motor speed, torque and direction. 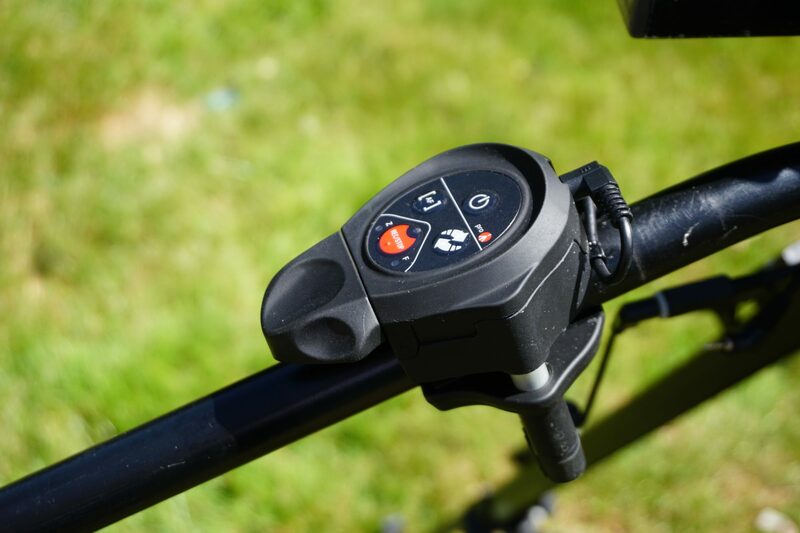 These controls allow you to fine tune the way the motor operates, so if you want you can have a fast snappy zoom, or if you prefer you can have a slower zoom. The control buttons are mounted below a soft waterproof membrane to protect the unit from dust and moisture. There is also a small LED display that shows the torque and speed settings. When zooming in or out this also shows the requested zoom speed. All the cables are connected to the box using very high quality Lemo connectors. I found that the FS5 zoom rocker with it’s limited travel seemed to work best for me when the motor was set to quite a slow speed. The motor has lots of torque, so it should have no problem driving lenses with quite stiff zoom rings. However I probably wouldn’t try to use it with a DSLR zoom. I dabbled with producing a zoom motor for DSLR zooms some years back, but found it very difficult. Most DSLR zooms are quite stiff, often have tight spots as well as only limited travel. This makes it very difficult to get a very smooth motion. Feel free to try it with whatever lenses it is that you have, but I think you will need to test the functionality with each photo zoom lens to see how it copes. For proper video and cinemas lenses with smooth zoom rings the VLC system should work very well. With the Fujinon MK lenses the motor can be attached to the barrel of the lens via a dedicated bracket. There is also a bracket for two motors for those that want to motorize not only the zoom but also the focus. 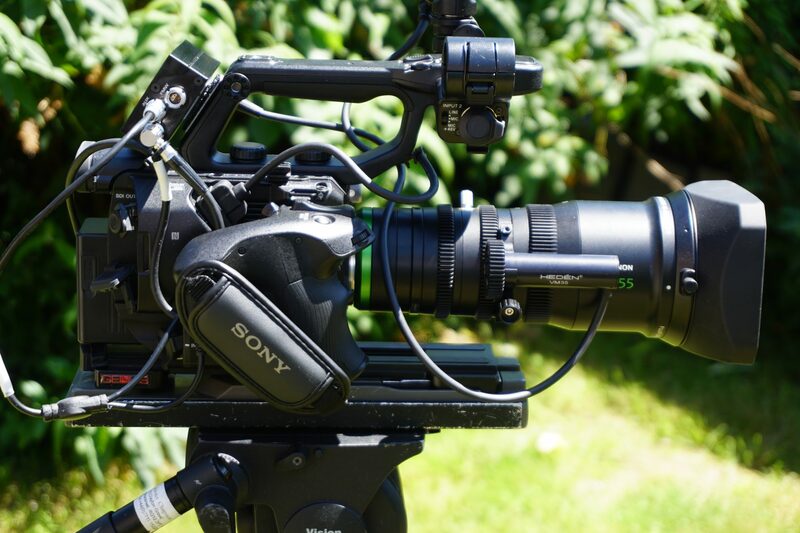 Dual motor bracket for the Fujinon MK lenses allows both a zoom and focus motor to be attached. The benefit of having the motor on the lens is that it’s always in the right place and you don’t need rails etc. The downside is that if you have more than one lens you need to either, swap the motor and brackets each time you change lens, have multiple brackets or if you have really deep pockets a motor and bracket for every lens. Swapping the motor from bracket to bracket is very quick and easy, just loosen the thumbscrew and the motor slides out. So I would recommend having a bracket on each lens and simply swapping the motor over. The other alternative is to use one of the Hedén rail brackets to attach the motor to 15mm rails, then when you swap lenses the motor stays attached to the rails and it’s just a case of lining the motor up with the pitch gear on the lens. Rod mount for attaching a single Hedén VLC system motor to a 15mm rod. Not long after starting to use the system on my FS5 I was informed that there was an update for the system that could work with any 3rd party Lanc Controller. So I decided to give this a try on my PMW-F5. To make this work you need an additional aftermarket Lanc zoom controller. These are readily available and there are lots of choices. 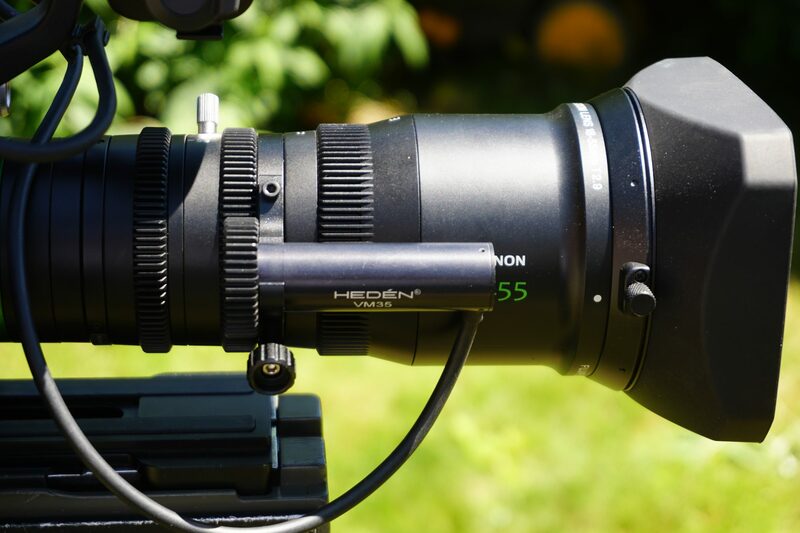 The Hedén VLC zoom system mounted on my PMW-F5 and Fujinon MK lens. 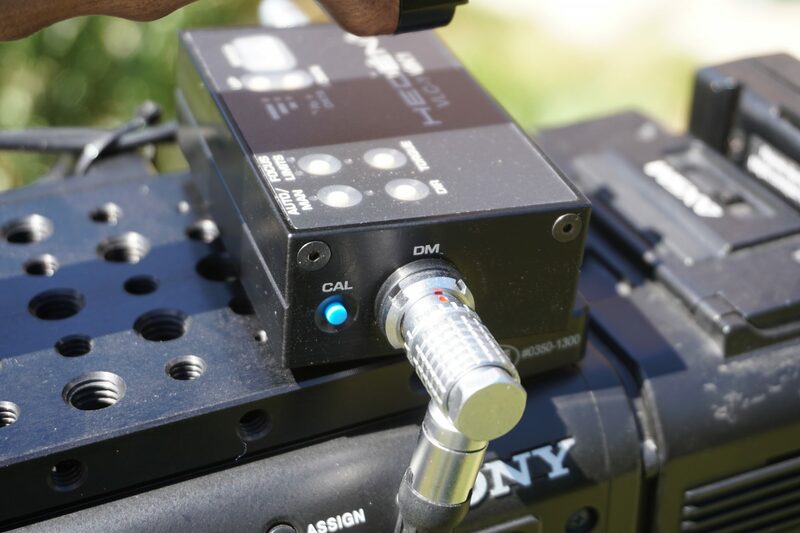 It’s much easier to find a place for the control box on larger cameras like the F5/F55 and FS7. The Manfrotto controller I used allowed me to operate the zoom from from the pan bar of my tripod. Great for studio or ENG type applications. The only thing you don’t get with an F5 and a Lanc controller is control over record start and stop as the F5 itself doesn’t support Lanc control. So you still have to press the record button on the camera. But this isn’t a big deal and having the ability to zoom from the pan bar is great for so many applications. Manfrotto Lanc controller mounted to the tripod pan bar. Overall I am very impressed with the system. The degree of control you have over the lens is quite remarkable, it’s just as good as the control you get with a high end ENG zoom. It’s very easy to setup and allows you to perform silky smooth zooms with ease. If you want smooth, slow starts to the zoom or extremely slow zooms, both are easily achieved with the Hedén VLC system. I probably wouldn’t use it for every shoot, especially with the FS5 as the control box is a little bulky. With the F5 or FS7 and other larger cameras this is much less of a concern, so I will probably use it more often with these cameras. I also want to explore using it with Lanc controller that I can use with handgrips when handheld (perhaps using the Vocas Arri rosette kit for remote attachment of the FS5 hand grip). The biggest strength of this system for me though, is that it isn’t actually lens or camera specific. You can use it with just about any lens and camera. So as you add more lenses to your collection, or if you change camera, you will still be able to use the VLC system just by making sure you have the right motor bracket. The 15mm rod bracket should work with just about any lens. This means that it’s a system that should last you a very long time.